Have you ever stood under a waterfall in a quiet place? Or maybe sat by a babbling brook listening to the soft sounds of nature? There is a ‘peace’ in that moment that we would like to hold on to. That’s the way I would describe the “Peace” of God. Of course, scripture tells us that the peace of God passes all understanding. Notice what else that verse says - the peace of God will guard your hearts and your minds in Christ Jesus. Let that sit a minute. I don’t know about you, but I have experienced that peace! It’s indescribable. Much more that the opening paragraph can express! I believe that’s what the '“peace” in the fruit of the Spirit is. It’s more than “Peace WITH God”, it’s the “Peace OF God”. You see when you have peace with God, you know your salvation is secure in Him. But when you have the peace OF God, though the earth shakes beneath you, you have peace in the midst of the chaos. That, my friend, is a beautiful thing. Life comes at us all. No one is exempt from crises, hardships, trials or failures. 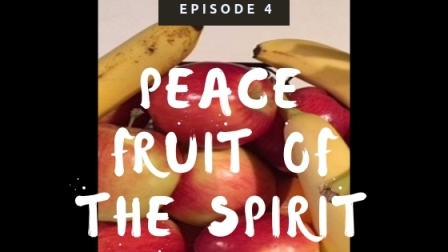 With the Holy Spirit growing the fruit of the Spirit in us, we can love beyond what we are naturally capable of; we can have joy in the middle of our circumstances; we can have peace because God is in control even in our mess. I think “Peace” is really resonating with me this week because I am reminded that we cannot always be at peace with others, but we can have the peace of God within. We cannot always (well, never) control our environment, but we can have the peace of God within. This week be encouraged! Peace be to you.